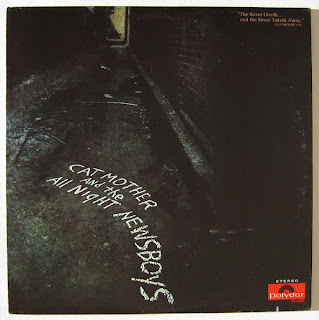 Cat Mother and The All Night Newsboys had one huge hit but at least they can go down in history saying that Jimi Hendrix produced it. As a matter of fact, Hendrix produced the whole album it came from, with the unlikely-title of The Street Giveth, The Street Taketh Away. The real beauty of this song is that it's completely unadorned, no special effects or edits, nothing deep or political, no guitar fireworks -- just five guys playing straight ahead rock and roll, taking vocal turns on the different verses, and just digging the highlights of these 50's classics. When it was 1968, these guys were 23 years old and the Big Bopper and Jerry Lee Lewis were the artists they grew up on. So it's kind of cool that they would record this simple tribute at a time when their producer Hendrix and others were pushing the boundaries of rock music, and it would become their sole claim to fame. The wonderful live performance clip below is from "The Rick Shaw Show," which was based in Miami, FL. I have their first two LP's, a bit scratchy, but still listenable. I converted them to play on the Ipod and was listening to both of them today. What became of those musicians? Anyone know? Though I like the first LP, the second on is my favorite and is thoroughly imprinted on my brain and lives on in there. Thanks guys, where ever you may be these days. You made some fine music. I picked up a copy of their first album as an 8 track in a sale bin. Remember cut outs and sales? I loved "Good Old Rock & Roll" and played the H out of it. It was just good old R & R. There was no pathos in the lyrics; just a good driving dancing beat. Those, for sure, were the days.